Happy National Taco Day 2013! It pisses me off that Austin has a way better taco scene than El Paso. They’ve already got so much going for them foodwise, why couldn’t we have it? We should be a triple threat with our unique border location. We’re next to old and New Mexico. Anyways, enough rant. Let’s get to National Taco Day 2013! Did you guys follow this year’s Vegan MoFo (Month of Food) posts? Or have you been hearing about the latest, revolutionary cleanse diet? Lazy Smurf and Lone Star Plate of Austin have taken taco eating to the ultimate level. They created the taco cleanse and ate tacos for an entire month. There’s levels and taco scientists and a book! The book has information, games, and recipes! You can order a digital or print copy online at Rabbit Food Grocery. The good news is that our taco scene is slowly being revived, and I think you can pretty much thank Tacoholics for that. They not only brought their interpretation of Korean BBQ tacos to El Paso, but they’re also making some outstanding classics. I might be a little biased since they’ve always offered tofu versions of the meat versions, but they really are that tasty, especially the salsas! Hit em up today and don’t forget about $1 tacos every Tuesday. They started out as a food truck and still bring the truck out once in awhile, but you’ll find them in a quirky location these days inside the Exxon gas station at 7450 Gateway East at Hunter. 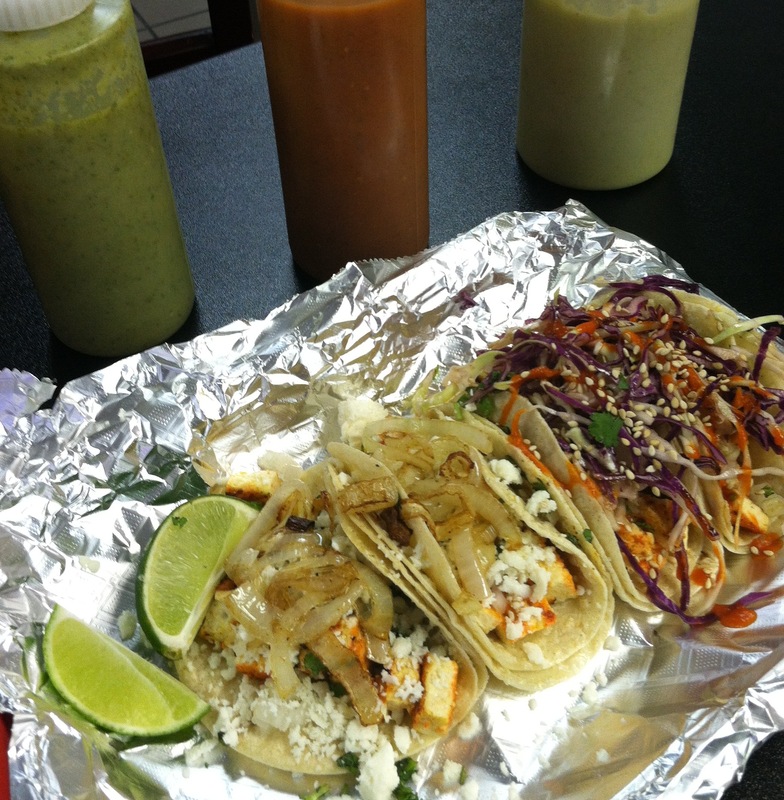 The best tacos & salsas in town! 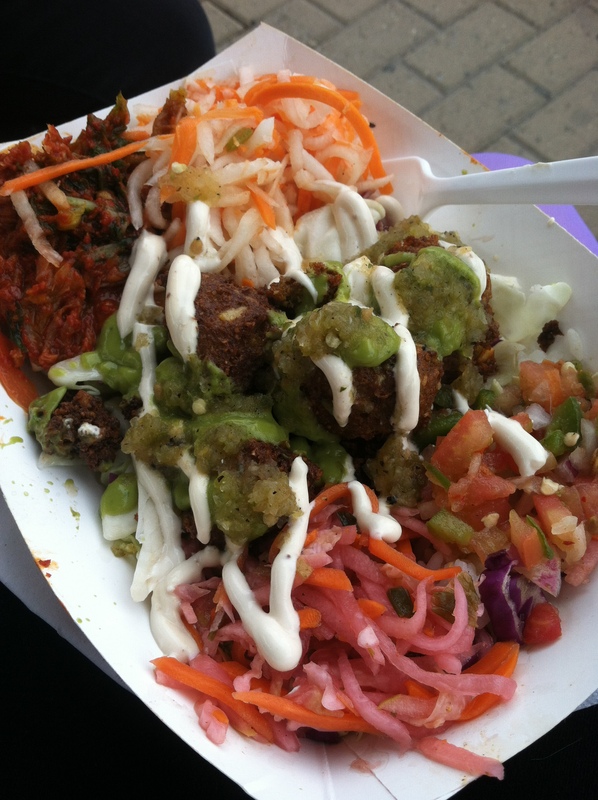 This year brought a new solar-powered food truck in town that does fusion food to the max. Their menu is creative and a little over the top. They’ve got takos, burritos, tostadas, bowls and flautas. The vegetarian filling for their creations is Mexilafel, a combination of chickpeas, avocado, jalapeno, cucumber and cilantro. I tied a Mexilafel bowl a couple of months ago at the Downtown Artist and Farmers Market. Everything was really tasty, but I felt a little overwhelmed by so many flavors. I had a stomachache after eating it, and I have no idea if it was from fusion overload or slightly undercooked rice. Also, the bowl came with kimchi, and I don’t think it’s vegetarian because it tasted really fishy. Next time I’ll stick with tacos and pass on the kimchi. You can catch them downtown at Foodville today from 11 am-2 pm. El Luchador 915 is the newest taco kid in town serving up more than 10 varieties, from classics to duck and rattlesnake. They opened last month on the eastside at 1613 N. Zaragoza. I’ve heard really good and really bad things about them. Their menu sounds interesting and fun, but there are no vegetarian options. What is this, El Paso in the 90’s? They’ve got rattlesnake, but they can’t even throw in some sort of veg taco? The Riviera. Get three tacos; one bean, one avocado & one potato (everyone’s favorite). I order them steamed. Leo’s. Guacamole tacos. I also order them steamed here, or I think their term is unfried. Star City Kitchen. Guacamole tacos. They also recently started a Taco Tuesday special where you can try them for a dollar. Haven’t tried them yet. Steveo’s. Tempura battered nopal and hongos (cactus & mushrooms) with jicama slaw and roasted red pepper aioli. This is a cool new place on the eastside and Create food truck’s brick and mortar restaurant. Haven’t tried the tacos yet, but their guacamole is delicious. It’s really citrusy. Taco Cabana. I know it’s a chain, but I LOVE good ol’ TC. They have black bean tacos, but I like getting a bowl because I hate that the tacos have more rice than beans and no guacamole. BTW, they already celebrated National Taco Day on Tuesday. Chipotle. Another chain, but they’ve got great vegan/vegetarian options, and don’t charge vegetarians extra for guacamole. I heard their pinto beans will no longer contain bacon. Also, sofritas have hit Colorado! I hope Texas is next. What, no mention of the latest taco sensation to hit El Paso the new Cool Ranch Doritos Locos taco from TacoHell??? I too loved the new taco concepts from Tacorexico. However, my only complain is that sometimes the flavors do overwhelm you and the ingredients weren’t fresh when I tried them. I’ll have to hit them up again. I know they’re not tacos (but they’re close) but you should try the potato flautas at Ke Flautas on Doniphan. El Paso you’ve come a long way baby! I know I should have included TacoHell! 🙂 I hate Doritos, but I might have to try the new fiery one because it has chile and lime! Rolled tacos count! I’ve been wanting to try Ke Flauta but wasn’t sure if it was worth it. Thanks for the tip!